Norman, OK – April 05, 2018 — Weather Decision Technologies, Inc.® (WDT), the world’s leading decision support and weather analytics company announces the release of RadarScope® 1.0 on the Microsoft Store. Version 1.0 includes basic RadarScope functionality, with in-app purchases of Pro Tiers 1 and 2 arriving later this year. The app is also available for Android, iOS and Mac. “Windows support has been one of the top customer requests for some time,” says Mike Wolfinbarger, VP Mobile Development at WDT. “We’re pleased to have reached a point where we can extend the RadarScope experience our customers have long enjoyed on other platforms to Windows 10." RadarScope launched in 2008 as only the 16th app on the Apple Store. 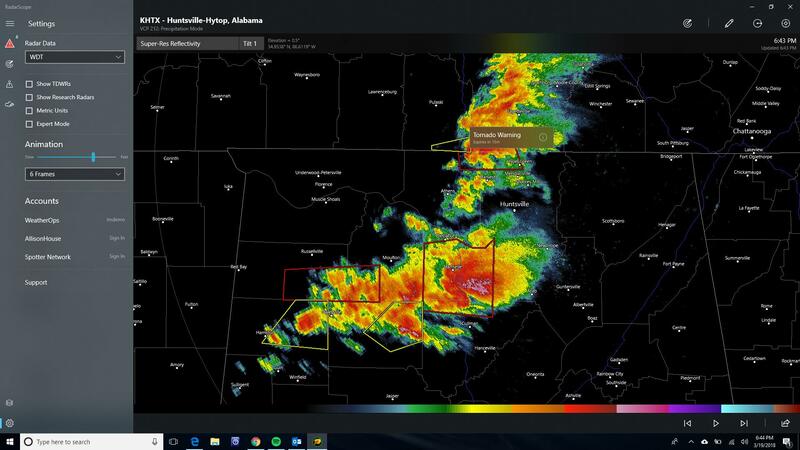 Designed for weather enthusiasts and meteorologists, RadarScope is a consistent Top 10 app that allows mobile, Mac, and tablet users to view and interact with high-resolution weather radar images, lightning data, and severe weather warnings. The latest reflectivity, velocity, and other radar products from any radar site in the United States, Canada, Guam, Puerto Rico, South Korea, and now Japan can be displayed on the app.